Always use the right tool for the job. But where do you use that tool? Unfortunately for guys living in apartments, having a dedicated workshop is completely out of the question. Usually our tools are exiled to the back of a cupboard or worse: Permanently stored in your car's trunk, which means they're never on hand when you need them. While we may not have the space for a full-size workshop, that doesn't mean we can't find space for a proper workbench. In every apartment I've lived in there has always been that one closet, stuffed full of old jackets I'll never wear, vacuum cleaners, and the yard sale golf clubs. Instead of using that closet as a dumping ground for crap that doesn't belong anywhere else, turn it into something you can actually use. 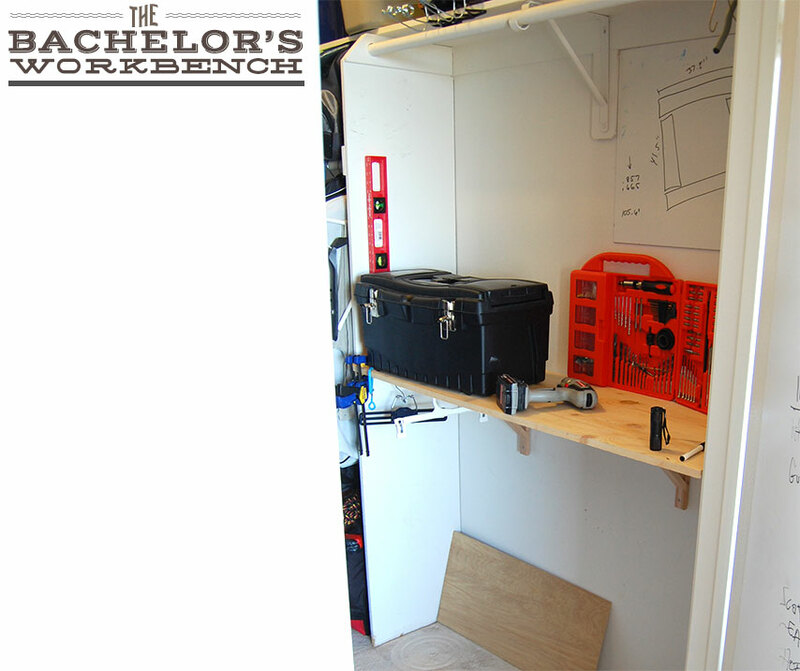 With nothing more than some brackets, screws and wall anchors, and a 16" x 8′ board cut to fit the space, a forgotten, tiny closet becomes quite a useful workbench. And, if your closet has two closet rods, you can put the bench above the bottom one, allowing full use to still hang those old coats. The total project cost me less than $25, and just required putting in screws, Lowes even cut the board for me. This is more of a girl’s craft bench than a work bench. Is this screwed into the studs? If not, there’s no way this will be sturdy enough for anything but the lightest home improvement projects that would be just fine on the kitchen counter. I guess it all depends on what your definition of ‘girl’s crafts’ are. All the diy projects I’ve done on Primer were in all or part done on my bench. I like this idea. I used an old desk I found on the side of the road for my college apartment work bench. This would be good for a city apartment where you need just a smaller work space if you don’t have a garage, basement, etc. Very cool.